This glorious print is one of a series showing the elaborate preparations for the wedding of the Prince of Wales, only the fifth to have taken place since the creation of the title, and the first at Windsor since 1361. 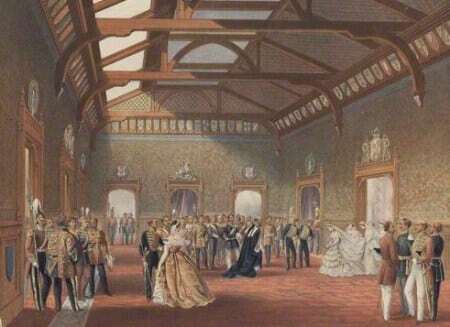 The wedding of Albert Edward to Princess Alexandra Caroline Marie Charlotte Louise Julia of Denmark on 10 March 1863 was the grandest wedding ever to be held in St George’s Chapel. With the court in mourning, Queen Victoria wanted the wedding to take place at St George’s Chapel, not in the capital. The Illustrated Times said that “a feeling not unreasonably akin to disappointment arose among the public that the claims of that unpretending town should have been preferred above those of London, the chief city of the empire and the world.” The chapel was “grey, crumbling, hoary, and without, almost ruinous in aspect”, but, when taking into account its standing as the home of the Order of the Garter and the glories of its interior “all things, then, considered, the selection of St George’s Chapel – if even the distinct expression of the Royal will did not enforce cheerful acquiescence – may be justified by a score of motives”. The date was set for 10 March 1863, and preparations began. The rooms for the Princess were even more sumptuous, fitted out with English lace and rose-coloured silk, garlanded with wreaths of orange-blossom and lilies, while those for the Prince were simple and elegant. St George’s Chapel may have been considered unsuitable for the occasion, but these magnificent chambers more than made up for any deficiencies in the exterior of the chapel. In a newspaper report from New Zealand, the rooms are described as: “… a mysterious reception chamber, hidden by the rich folds of a vast drapery of purple silk, and within are waiting the invited guests of the Queen, ready to form into a procession, when the proper moment comes”. From these chambers, Princess Alexandra emerged to begin her procession up the Nave to the altar where her husband-to-be waited. She would enter as a Princess of Denmark, and leave as the Princess of Wales. Edward and Alexandra were married for over 50 years and despite his continued affairs, it was a happy one. By the time he became King in 1901, Edward had been Prince of Wales for 59 years, 45 days.